Awesome Adaptations is hosted by Picture Me Reading, and is a focus on book-to-movie adaptations that we think are awesome! Today’s topic is an awesomely twisted adaptation. I learned a few weeks ago from the Top 10 Tuesday topic of Best/Worst Book-to-Movie Adaptations that a lot of people don’t like this 2005 movie at all. But I am a proud fan of this movie, and I want you to hear me out! And the whole thing with Charlie and the fizzy lifting drinks, where technically he broke the rules like the other kids but didn’t get caught right away and made things right in the end… I just don’t like it. It’s interesting because even Freddie Highmore (who played Charlie in the 2005 adaptation) said, “I think the original film is good, but I think it’s better now because Charlie is kept more pure.” I love the Charlie in the new film so much more. I sympathize with him much more and root for him much more. I know it’s great to have flawed characters, I’m not trying to say it’s not, but Charlie is a good kid who loves his family and works hard to do the right thing, and I think that shows so much more in the 2005 film. The theme of family is the other big reason why I think this film is great. We get Willy Wonka’s back story of his childhood and with his dad, and Charlie is actually able to help the Wonkas restore their relationship. Tim Burton said of his version of Wonka: “You want a little bit of the flavor of why Wonka is the way he is. Otherwise, what is he? He’s just a weird guy.” I can understand the appeal of the mystery of Willy Wonka, but I like this take too. And he does have a nice character arc, which I always appreciate in a story. And I think all the kids were done just as well in this movie as they were in the original, though I was a little sad that I didn’t get to see the new Veruca Salt sing, “I Want it Now.” Fave part of the original movie! So give it a chance! Maybe you saw it once and disregarded it, but I like it better now than I did the first time I saw it myself. Tell me what you do like about Charlie and the Chocolate Factory! Or why don’t you like it? Johnny Depp terrifies me! Just saying. I think he single handedly made the 2005 adaptation not as well liked for me. I just found him creepy. Even more creepy than the first movie (which also proved to be disturbing). I still loved the original more… Partly for the strange little Oompa Loompas, but mostly for the music and framiliarity. I feel like both strayed from the book at points (what movie doesn’t? ), but I still preferred the first one by a landslide. Maybe mostly because I loved the first so much, so the second couldn’t compare. And also because I am scares of Johnny Depp. Yes, when Gene Wilder’s Willy Wonka yells at Charlie, hate that part! Glad I’m not alone in this! I think I watched both movies, only I can’t remember which was which and which one I actually liked. But I think the CD we have is of the older one. Like a soundtrack CD? The original does have a lot more songs. Yes, the new oopma loompa songs are so much better in my opinion! So glad to know someone else likes the movie so much! And yes, love Freddie Highmore! Have you seen him and Johnny Depp in Finding Neverland? If not, get your tissues ready! I must still read the book though! Love this write up! Yes, I still need to read it too! Ah I have The Book Thief to read – I need to get to it soon cause the trailer looks amazing! Definitely read The Book Thief before you watch the movie if you can! The Book Thief trailer was great- I guess Death lost his big part? Looks like. It’s sad but at the same time, I’m not sure how it would have worked in movie format. 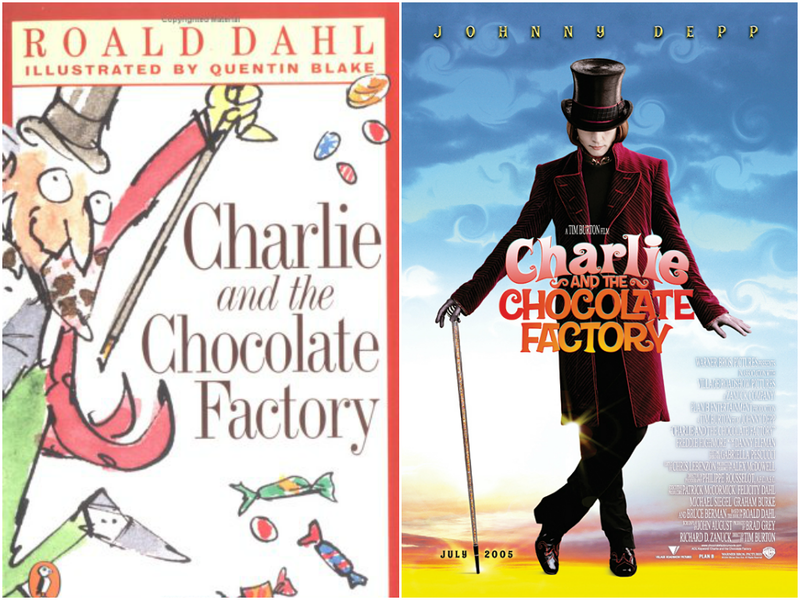 As for Charlie and the Chocolate Factory, I find it really interesting (and perhaps frustrating) that Dahl actually disapproved of the first movie and that somehow the second version is more *right*. To be quite honest, I really didn't like the Johnny Depp version. I thought it was just icky and uncomfortable and weird (although maybe that's what they were going for?). I mean, I guess I kinda felt that way about the first version, but the newer version just make me want to run from the room, lol. Although, I do agree that Wonka had a nice character arc in the newer version. To be fair, Dahl was not alive to see the second film, but his widow and daughter liked it much more. Apparently Tim Burton got to read some of the original writings of the story that ultimately did not make the cut, so I guess something in those writings may have inspired the tone, I don’t know. The first one has always been my favorite, and because of that, and some of the different levels of weirdness in the new one, I didn’t like the new one as much. Having read your perspective on it, and Dahl’s and Burton’s thoughts, I’d love to watch them again back to back and see what I think now. It’s been years since I’ve seen Burton’s version and really need to refresh my memory. I always disliked Charlie breaking the rules with the fizzy lifting drinks in the first one as well, and everything being made magically okay in the end. It was completely out of his character to do that and felt like it was added in just for dramatic effect. The newer Charlie is definitely much more charming (and sad and relatable). So glad I’m not the only one who feels that way about the fizzy lifting drinks! Definitely out of character and strange.